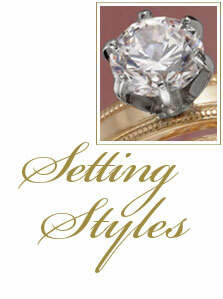 There a number of different types of engagement ring settings to choose from when selecting the right ring. The setting is not just decorative, but it is what keeps the stone or stones securely mounted in an engagement ring. Listed below are some of the most popular settings used at Danforth Diamond. Prong Setting - The most popular and traditional engagement ring style, often referred to as a "Tiffany," classic or claw setting. This setting normally has 4 or 6 individual claws of metal that hold a stone in place. The prongs are set to fit the crown angle and the pavillion angle. The upper part of the prongs, which are bent over the crown of the stone, keeps it securely in place. When choosing between 4 or 6 prong diamond engagement rings for women, keep in mind that when set in 4 prongs, a diamond will look more square. It is also not as protected as a diamond set in 6 prongs. When set in 6 prongs however, while adding more protection to the diamond, more of the diamond is covered and that may not be the look you are going for. Consider using a 6 prong setting for diamonds larger than 1 carat or greater than $10,000. If you do choose the 4 prong setting, be sure to choose a platinum setting, as it is stronger than gold. Channel Setting - Stones are set between vertical walls of metal. In this style of engagement ring setting, stones are set side-by-side, with no metal separating the stones. The diamonds are sunk into the ring, so they are practically flush with its surface. This contemporary style is very popular for diamond engagement rings for women, but is also considered very classic. These settings are often used in wedding rings and anniversary rings. Basket Setting - The basket setting is used on many of the ring designs at Danforth Diamond. It is similar to the prong setting, but in addition to the claws that hold the ring, there is an additional ring of metal that secures the prongs, to reduce any prong movement. Bar Setting - Diamonds are set between bars of metal that are perpendicular to the ring. This engagement ring setting is more contemporary, but still retains a classic feel. Pavé Setting - In this setting, many small gemstones are placed in tapered holes creating a "pavéd" appearance. Diamonds are usually set in white gold to create a sparkle finish. Bezel Setting - A ring setting in which a metal rim holds the stone and completely surrounds the gem. Bezels can have straight edges, scalloped edges or can be molded into any shape to accommodate the stone. It is commonly used with half-domed stones (called cabochon cut stones), but is also a popular setting for faceted stones. Half-Bezel Setting - Similar to the Bezel Setting, but the Half-Bezel does not completely surround the stone. Additional light is able to reach the stone and therefore, creates a higher degree of brilliance in these engagement ring settings. Tension Setting - A "floating" diamond. A tension set diamond is held in place by the pressure of the shank's metal, which is designed to "squeeze" the engagement ring stone.